Preview: Things were looking up for the Hokies in 2014 after their early season upset road win against Ohio State, but things went south quickly thereafter losing back to back home games against East Carolina and Georgia Tech. The Hokies are coming off another lackluster campaign as the team was able to get 1 game above .500 with back to back wins to close out the year coming against Virginia and Cincinnati. The luster of head coach Frank Beamer is starting to fade and the fan base is getting impatient given they aren’t used to these types of seasons. In his time as the Va Tech head man Beamer has picked up an impressive 231-115 overall record over 27 years. It’ll be a make or break year for OC Scott Loeffler who’s spent the past two years implementing his system with a young core of players. Many key contributors return for the Hokies including starting QB Michael Brewer who had flashes of solid play throughout the season mixed with inconsistent play. There remain some question marks around the effectiveness of the O-line, but with 4 returning starters the coaches are very hopeful that this unit can show improvement. The run game is an open competition with a number of guys ready to prove themselves. The receiving corps returns 4 starters and this unit should be solid with guys like Ford and Phillips leading the way. Virginia Tech is always known for their hardnosed defense and that was the case again in 2014 even with all the offensive issues putting this unit in tough spots. This defense was even able to hold the national champs to just 21 points in a true road game. The defense should be strong again in 2015 with 8 returning starters back in the fold. 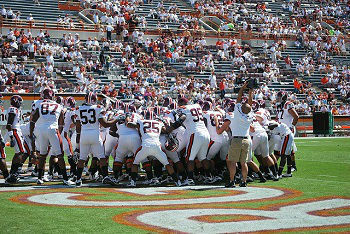 Virginia Tech has tremendous strength up front with all 4 starting D-linemen returning. This is one of the better D-lines in the nation with all 4 starters having earned all-conference honors at some point in their career. The LB position is more in flux and this unit hopes to build around guys like Motuapuaka and Clarke. The secondary is another strength of the defense and this unit will build around CB Kendall Fuller who’s one of the top guys in the nation at his position. Prediction: It’s been an extended period of mediocrity for Virginia Tech and if things don’t turn around the seat will start to get hot around Beamer. The Hokies have been .500 in conference play over the past few seasons, but in the wide open ACC Coastal this squad can actually compete for the division title. Virginia Tech needs to develop at the QB position and they should get more consistent play out of second year starter Michael Brewer. The defense remains strong and that’s something for this program to build their success around in 2015.